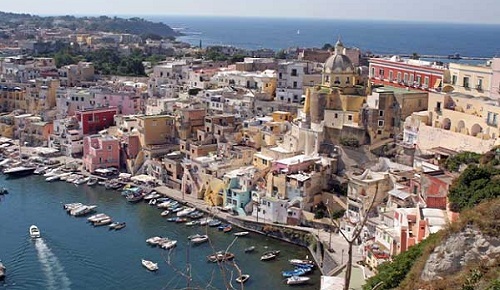 Procida is one of the Flegrean Islands off the coast of Naples located between Cape Miseno and the island of Ischia. The origins of the name of the island is lost between reality and legend. Probably, the name comes from the Latin Prochyta, meaning 'near Cuma'. According to another theory, Prochyta comes from the Greek verb prokeitai, meaning 'it lies forth'. Yet another theory suggest that the name derive from that of a nurse of Aeneas called Procida. 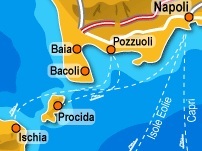 Geologically, Procida was created by the eruption of four volcanoes, now dormant and submerged. During Roman rule, the island became a renowned resort for the patrician class of Rome. After the fall of the Western Roman Empire and the Byzantine reconquest in the Gothic Wars (6th century)), Procida remained under the jurisdiction of the Duke of Naples. The continual devastation first by the Vandals and Goths, and later by the Saracens, pushed the population to resettle in a fortified village typical of Medieval times, thus acquiring the name of Terra Murata, (Walled earthwork). The Napoleonic Wars brought several episodes of devastation due to the island's strategic position in the naval engagements between French and English. 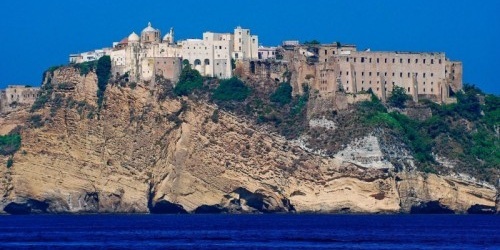 In 1860, after the fall of the Kingdom of the Two Sicilies, the island became part of the newly formed Kingdom of Italy. The island is located at a approximately 5 km from the mainland and is connected by a thin bridge to the smaller neighboring island of Vivara. 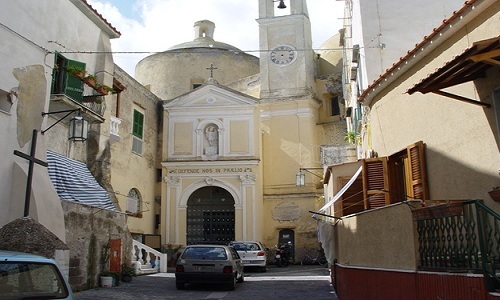 The town is divided into nine districts: Terra Murata (the oldest suburb) Corricella (a quaint fishing village), Sent'cò with the commercial port of Marina Grande, San Leonardo, Santissima Annunziata (also called Madonna della Libera) Sant'Antuono, Saint Anthony and Chiaiolella (touristc port). In the last few decades, the population has slowly begun to grow. 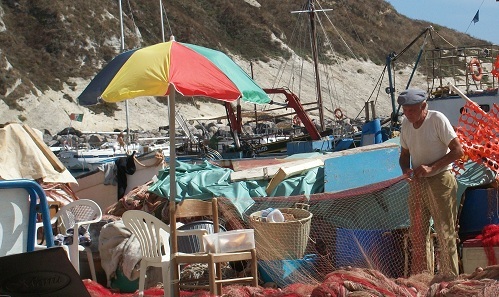 The economy remains in great part tied to the marine industry. Coming to Procida by ferry or hydrofoil, the first impact with the island is given by the characteristic colorfoul houses of the fishermen. The harbor area is densely populated, and there are plenty of shops and restaurants. Looking towards Ischia you can see the uninhabited islet of Vivara, completely covered with Mediterranean vegetation. 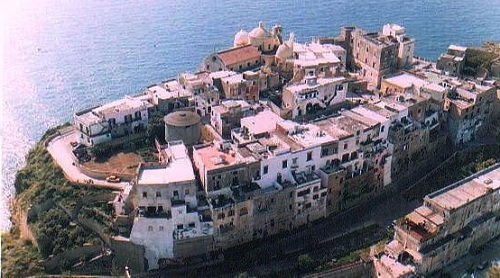 Procida has been chosen as a film set for numerous films, mainly for its panoramas and its typical Mediterranean architecture. The most famous are il Postino and The Talented Mr. Ripley. To admire its beauty, to enjoy those shows transfused in art, in literature and in the many movies filmed there, you have to wander through its streets and its alleys. Proceeding along Via Roma, we reach Punta Lingua where you can witness the majesty of Terra Murata, forming a wall of natural origin. In this area you will find the Abbey of San Michele Arcangelo, built by Benedictine monks in the eleventh century, which houses important works of art, and the Palazzo d'Avalos, with its illustrious past but used as a prison, until a few decades ago. 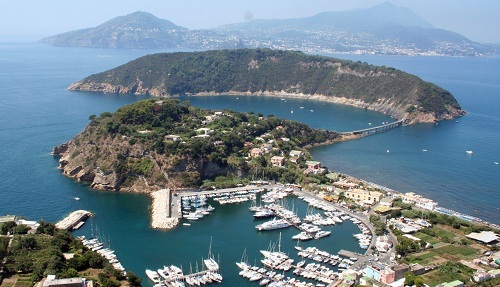 Beyond Punta Lingua we find the natural harbor of Corricella, still the center of intense fishing activity, further along there is Via Panoramica where one can enjoy breathtaking views of Naples and relaxing walks. 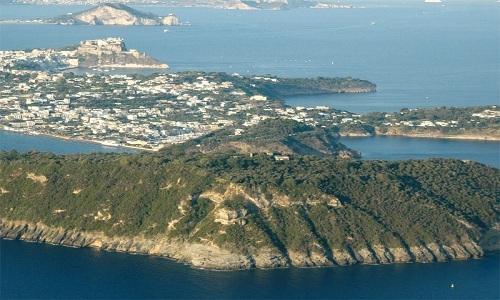 Diametrically opposite to the harbor is the beach Chiaiolella, the island's most popular beach, which follows the contour of an extinct volcano and overlooks the island of Ischia. 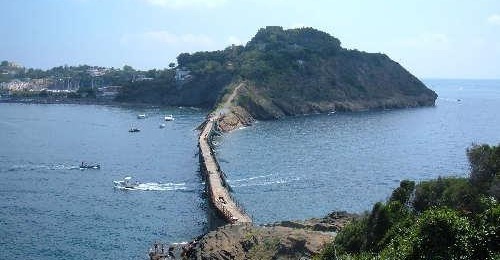 On one side of the beach, a wild hill provides the gateway to the small island of Vivara, connected to the mainland by a narrow bridge. The island, once a hunting reserve for the king, is now an archeological park and can be visited by appointment with local authorized guides. he interior of the island is crisscrossed by roads overlooked by villas and old buildings and charming small houses along with numerous churches and chapels dotted by the many unexpected open spaces from where you can admire the surrounding views. There are many religious traditions on the island tied to the period of Holy Week before Good Friday. The most evocative of these are the Procession of the Apostles of Holy Thursday and the Procession of the Mysteries of Good Friday. The last one is based on a tradition going back to the end of the 17th century. 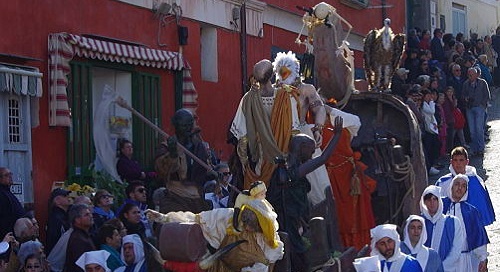 In the procession, the young males of the island, dressed in the traditional dress of the "Confraternity of the Turchini", carry allegorical wagons (called "mysteries") of religious character for a fixed distance, from the village of Torre Murata to the port of Marina Grande. The "mysteries", often highly artistic, are prepared by the young people and generally nobody except them would have, at least in theory, seen them before the procession. After the procession, they are taken apart or destroyed. Every summer, there is an election of the Graziella ("Little Graceful"), a young woman that wears the customary clothes of the island, referring to the history told in Alphonse de Lamartine's novel, Graziella. Also during the summer, a literary award dedicated to Elsa Morante and her novel, Arthur's Island, is presented.